Installation. Synchronised slide projector and quadraphonic sound. 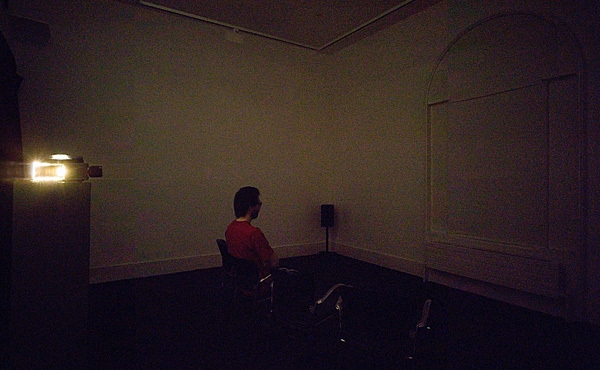 In this installation, the viewer was seated in the centre of a totally blacked out room which had a speaker in each corner. A slide projector, also in the centre of the room at the back, advanced through a sequence of blank slides. The sound of the slide changing and the projector fan was audible, but there was no visible image and no light apart from that leaking from the rear of the projector. Each time a new 'slide' was selected, sound faded up in one of the speakers behind the viewer, a fragment of one of the audio recordings from the Sligo anti-tour. It moved diagonally through the space, slowly disappearing into one the front speakers after a couple of minutes. Following a brief pause, the slide projector advanced once again and the sequence was repeated, this time with a different recorded audio fragment.